I know I've been tagged by the Next Big Thing meme before, but it's happened again - and it really couldn't have come at a better time. So, here we go. YOU ARE THE HERO – A History of Fighting Fantasy Gamebooks. My love of Fighting Fantasy gamebooks. The fact that 2012 marks 30 years since the publication of the first one, The Warlock of Firetop Mountain, and 20 years since my first commission, which was also for a Fighting Fantasy gamebook – Spellbreaker. And because I wrote a piece on the subject for SFX Magazine in the year, which I soon discovered barely scratched the surface of the story waiting to be told. Non-fiction, but non-fiction about the gamebook genre, specifically fantasy adventures. I guess Steve Jackson and Ian Livingstone would have to play themselves, as any such movie would need to be a documentary. A 'coffee table' book celebrating 30 years of Fighting Fantasy, the publishing phenomenon created by Steve Jackson and Ian Livingstone, written by gamebook guru Jonathan Green. Chronicle City is actually going to publish the book, as long as the Kickstarter raises the necessary funds. I’ve not written it yet, but I’m anticipating it will take a couple of weeks. It will be the interviews and preparing the book for publication that will take up much the time. None. This book is unique. So back the Kickstarter today and make the fantasy a reality! Steve Jackson, Ian Livingstone and Fighting Fantasy gamebooks, of course. 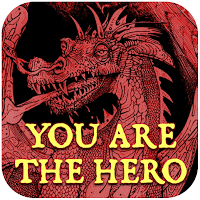 YOU ARE THEHERO will tell the story of Fighting Fantasy gamebooks, from the early days of Games Workshopright up to the present day, and beyond. I have already interviewed the creators of the Fighting Fantasyseries – Steve Jackson and Ian Livingstone – who are both keen to have their story told. In fact, Steve Jackson once said to me, "You are the perfect person to write this book." I have also interviewed many other people who’ve been involved with Fighting Fantasy over the years. These include authors and editors – such as Dave Morris, Robin Waterfield and Marc Gascoigne – the artists – people like Russ Nicholson, Martin McKenna, John Sibbick and Leo Hartas – and fans of the series, such as New York Times bestselling author Graham McNeill, founder of Tin Man Games Neil Rennison, and author, actor and comedian Charlie Higson. 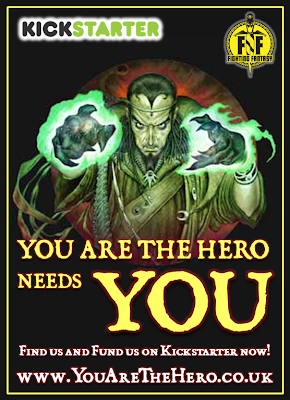 I want YOU ARE THEHERO to be something special, a book worthy of commemorating such an extraordinary achievement and the impact Fighting Fantasy gamebooks have had on the world. As a result, the first print run of YOU ARE THE HERO will be a limited edition. The book will feature brand new, specially-commissioned cover art by Martin McKenna, as well as original artwork from the series, and a foreword written by Steve and Ian themselves. Not only will YOU ARETHE HERO tell the amazing story of how Fighting Fantasy gamebooks changed the world, it will also cover everything from spin-off novels and puzzle books, to foreign editions, board games and video games. It will even delve into such areas as the gamebooks that never were, the myths and legends surrounding the series, and how Ian Livingstone’s newest gamebook – Blood of the Zombies– almost never happened. Thanks to Kickstarter we have a once in a lifetime opportunity to create a book about the history of Fighting Fantasy. But now it’s up to YOU! The more YOU pledge, the more impressive this book will be –with more artwork, higher spec production values and more content. I would love this first limited edition to be a hardback, and with YOUR help it could be. But without your support YOUARE THE HERO can never happen. If you have any interest whatsoever in the British games industry, adventure gamebooks or fantasy fiction, then this book is for you. 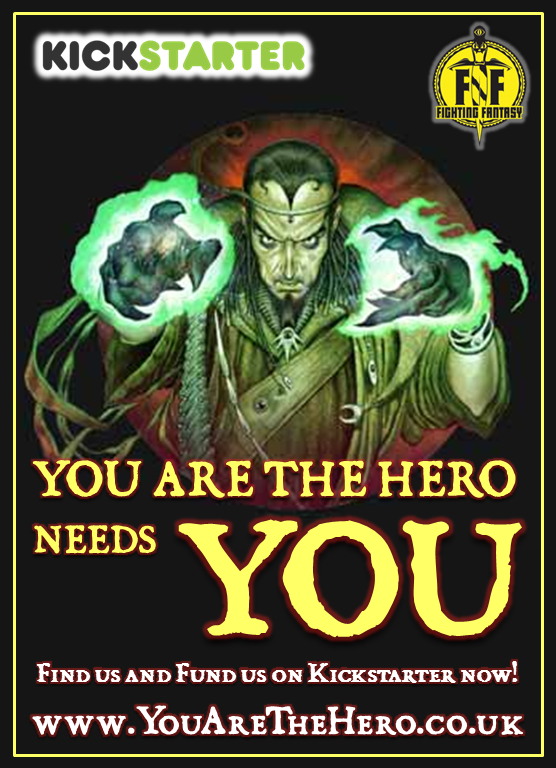 Check out the rewards on the YOU ARE THEHERO Kickstarter page and pledge your support today! Remember – only YOU can make this book happen, because, thanks to Kickstarter, YOU ARE THE HERO! You can find out more (and pledge your support) by clicking this link.